Mobile and social platforms are gaining control over the distribution of information. Newsrooms have to adjust both their content and business strategies. Publishers and broadcasters have historically “owned” the relationship between consumers and the content they consumed. This continued during the first part of the digital era with the supremacy of news company websites. Social platforms and search engines were seen as important because they could send traffic to publishers. Increasingly, this is an outdated view. Largely because their interfaces work better and faster on mobile devices, the platform companies are starting to own the relationship with readers and viewers. New publishers have come to see these giant companies not only as drivers of traffic but media powers in their own right — valuable partners but also long-term threats. The platforms are much larger than news companies. Their engineering talent and agility are far superior. And news is but a small part of what they do. Whether it’s Facebook with Instant Articles, Apple with its News app, Google with Accelerated Mobile Pages (AMP) — or, in a slightly different way, Snapchat with Discover and Twitter with Moments — companies that have roots in the technology industry are now hosting and presenting what publishers used to host and present. Publishers can no longer assume that people will come to them. They have to go where the people are. “Distributed content” is one name for this trend. It should be watched closely by anyone with an interest in journalism, for it could affect everything from storytelling formats and user experience to workflow and financial sustainability. If Facebook’s mobile app hosted publishers’ pages, the relationship with customers, most of the data about what they did and the reading experience would all belong to the platform. Media companies would essentially be serfs in a kingdom that Facebook owns. Smartphones and tablets now account for 62 percent of all digital media time spent. We want to reach current and future readers on all platforms, and we aren’t holding anything back. 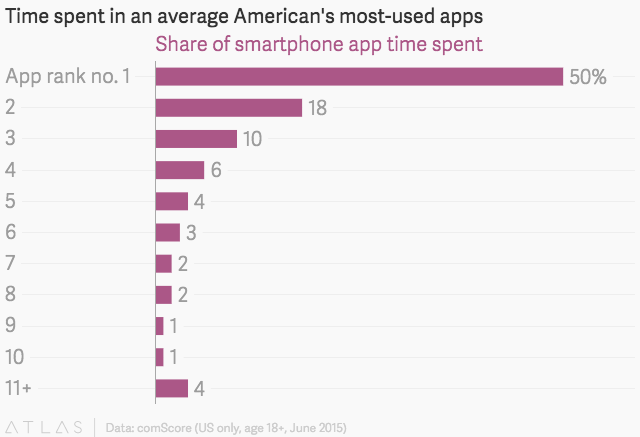 Seventy-eight percent of the time people spend on smartphones is concentrated in just three apps. None of those apps are likely to be of a specific news media company. Featured photo by Jason Howie used under a Creative Commons license. Because distribution patterns define how the users get in touch with journalism, who gets to make money and who "owns" the relationship. Ben Thompson is the author and founder of Stratechery. Ricardo Bilton is a staff writer at Digiday. Jack Marshall is a digital media reporter at The Wall Street Journal. Lucia Moses is a senior editor at Digiday. A Google initiative that aims to improve the performance of the mobile web by using a custom framework designed to help pages load instantaneously on any type of phone, tablet or mobile device. A feature that allows publishers to upload their content directly to Facebook, which lets people open articles within the app — not as a link to the publisher’s website. Brazilian journalist with a background in radio. Wants to find out how to make journalism financially sustainable. Likes the sensation of doing something entirely new.